Miniature Donkeys are intelligent, comical, friendly, endearing little creatures that create extraordinary human/equine bonds. A relationship with them is often more like owning a dog rather than what most people consider as an equine relationship. They really make an emotional bond with their owners, and with anyone else who gives them a chance. They will ask for your attention with nudges, brays, and funny little sounds. They learn quickly and are very eager to please. Miniature Donkeys are inexpensive to live with and almost trouble free as they are hardy and long lived. They are safe around small children and those with physical or mental considerations. They have highly adaptable personalities that lend themselves to a myriad of situations. Having Miniature Donkeys in your life is like bringing home new friends. They have enriched and broadened my life for many years and I don’t expect to ever be without them. Miniature Donkeys are native to the Mediterranean islands of Sicily and Sardinia. Bred to be small, tough, docile, and trainable, they were used to carry firewood, deliver freshly baked bread, pull carts filled with laundry, and were used to pull ore carts in mines. It is easy to observe today how the donkeys’ demeanor fit the lives of rural people. Because these industries have changed native Miniature Donkeys are no longer used for these purposes and are almost extinct in their lands of origin. 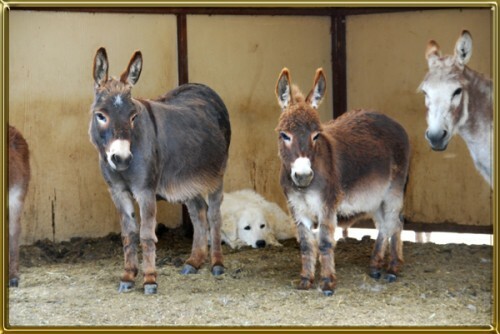 They have been crossed with standard sized donkeys to create a more versatile work animal. Because of this the Miniature Donkeys in North America have global genetic value. They were first introduced to this country in 1929. Today there are over 52,000 registered in the United States. Many more are registered in Canada, and recently they have become a popular export to Europe and other foreign countries. Miniature Donkeys must not measure more than 36″ at the withers to be registered and come in a variety of colors including grey, brown, sorrel, black, or spotted. They are referred to as jacks, jennets, and geldings. The life expectancy of a well cared for Miniature Donkey is around 30-35 years and they can often do that with a minimum of special needs. Their conformation should be that of a well rounded animal standing on four straight legs with all parts in symmetry and balance. They should also look athletic and capable of performing a multitude of tasks. 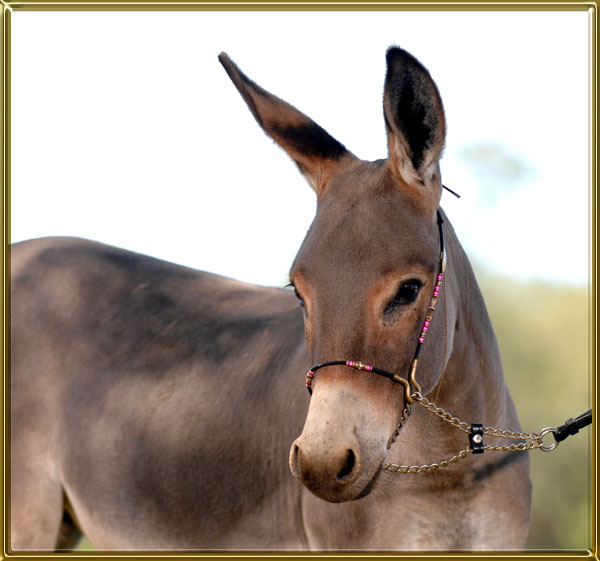 The average donkey will weigh 250 to 450 pounds and stand 30″ to 36″ high. Most are in the 32″ to 34″ range. Miniature Donkeys are easy to live with and economical to keep. They need shelter from the elements but don’t need to be fussed over. A three sided shelter is perfect for them as they will go in when they need to. They don’t require blanketing or confinement in inclement weather as they have an excellent sense of self-preservation. Most are really disgusted with rain but don’t seem to mind the cold. They need room to run and play but require much less space than a horse. Good quality grass or grain hay is perfect for them, with alfalfa and grain being rarely appropriate. They require a high fiber – low protein diet. They founder easily if overfed and this and related issues is the number one killer of Miniature Donkeys, other than advanced age. They need their hooves trimmed every six to eight weeks, should be de-wormed every two to three months, and require the same vaccinations and schedule as a horse does. One of the most important things to understand about these little guys is they need each other, even when kept with horses, sheep, goats, etcetera. They are tremendously social and their play behavior with each other is much like that of a young horse but they never outgrow it. They play with toys, rear and box at each other, and have several happy attacks a day. Watching donkeys play is a delight and I often sit back with a cup of tea or a glass of wine and enjoy the show! Miniature donkeys are wonderful friends and companions. Children can be given great freedom with them because they seldom bit or kick and they crave attention. Even small children can be successful handling a friendly donkey and that can really foster self confidence and teach the benefits of nurturing. I have placed donkeys in group homes and therapy situations. They are also a great companion to the elderly or those who for various reasons are not able to interact the way they used to with their horses. Miniature Donkeys are very rewarding to train because of their quick intelligence, inquisitive nature, and eagerness to please. 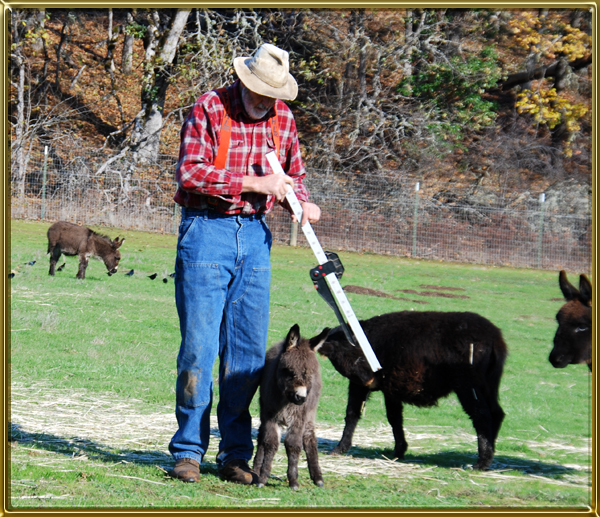 Breeding and raising Miniature Donkeys is lots of fun and is much less stressful than dealing with horses. They are considered of breeding age at three to four years old and can foal into their twenties. 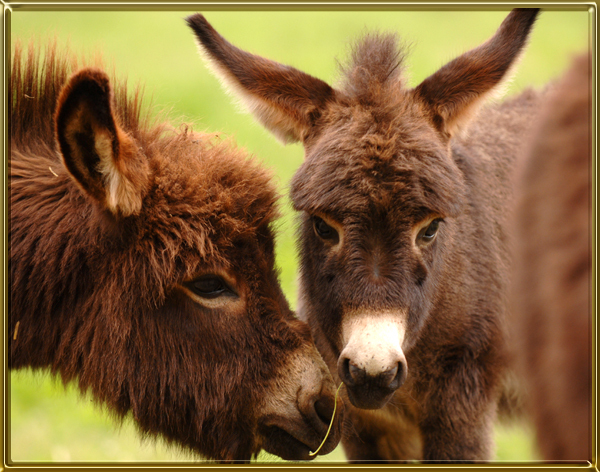 There is usually very little, if any, veterinary involvement in breeding donkeys. Because of their size most breeders don’t routinely do pre or post foaling exams or ultrasound exams. Breeding fees are typically in the $300 – $500 range with top animals commanding up to $1000. These fees usually include “mare care” so typically this is the only cost to breed. Those of you who have broodmares know that the breeding fee is often only the beginning of the story. Not so with donkeys. Miniature Donkeys conceive and foal easily and are generally comfortable with sharing a newborn foal with their owner; the foals are often friendly at birth or shortly thereafter. I am a tad biased but I think there are few things cuter than a baby donkey. They weight about twenty pounds, range in size from 18″ to 24″ at birth, and will climb right up in your lap if let them. Only a cold heart could resist! The decision to breed comes with a responsibility. 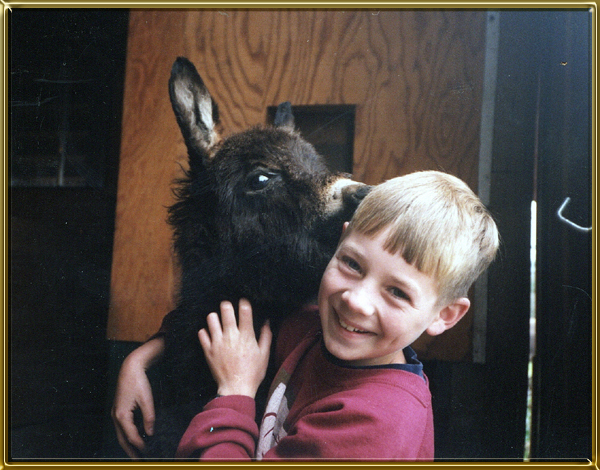 There is a difference between a wonderful pet and an animal worthy of adding to the Miniature Donkey gene pool. A conscientious breeder breeds the best jennet he/she can afford to a high quality jack, even if the intention is to produce “only a pet”. Today’s breeding animals provide the gene pool of the future. Donkeys live a long time and who can say what decisions will be made down the line and breeding “only pets” is not good for the future of Miniature Donkeys. If you are new to genetic principals and husbandry it would be helpful to you to find a knowledgeable, responsible breeder to ask questions of. Most breeders are happy to assist. I really enjoy mentoring new donkey owners. Good quality Miniature Donkeys can be a wise investment. A donkey with correct conformation and that is registered with known pedigrees, preferably of those bloodlines proven to consistently produce quality offspring, is a valuable asset in a discerning breeding program. There is no free lunch and raising donkeys take time, money, and lots of work but the profitability is very different than it is for most horse breeders and the emotional reward is great. For instance, I estimate my annual cost per donkey to be something less than $400. Worthy breeding jennets can be purchased for $2000 to $4000 with better quality jennets sporting a price tag of up to $10,000 plus. Starting in the lower price range at an entry level is how most people begin and many breeders never go beyond that. There is a place for all of us and as long as you breed with an eye towards conformation and genetics you will do just fine. Breeding quality jacks should be in the top 5% of the population, quality wise, and will sell for $2000 to $6000 typically. Pet quality geldings bring $800 to $1000 and show quality geldings may bring up to $2500. Even the best breeders will produce pet quality animals from time to time and sometimes these are the most loved of all. Financially, you can see that whether you produce a jack, jennet, or a foal to be gelded the profit margin is very different than that of most horse breeders. 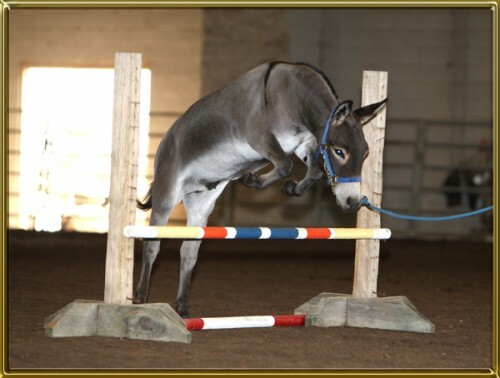 Miniature Donkeys are also safer and less complicated to deal with making them a good choice for a beginner. I think there is a strong argument to be made regarding the wisdom of purchasing high quality donkeys; it costs the same to feed them as a lesser quality donkey but their foals bring a higher price which will help pay the bills. 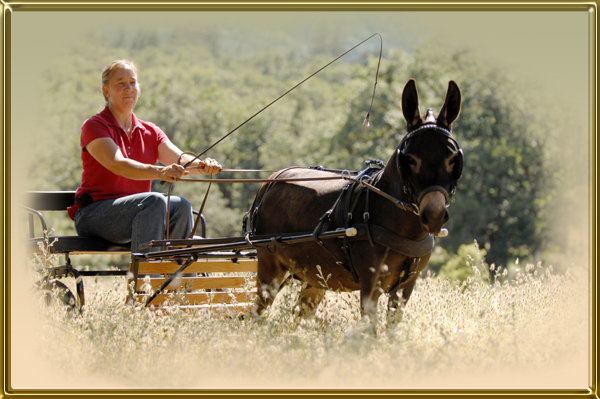 This will allow you to chase your donkey dreams and producing good quality foals is beneficial to all of us. It is very realistic to have your donkeys pay for themselves. Marketing skills and dealing with known, popular bloodlines will have much to do with the price your foals will bring. Now, even with these little guys it’s work! This is not the next get rich scheme but your responsible efforts will be rewarded. The future of Miniature Donkeys is strong and secure. I have been a breeder since 1992 and have seen them steadily rise in popularity. Here at Benson Ranch we strive to produce high quality breeding stock and have just over 100 Miniature Donkeys, all with their own personalities and charm. We produce a few pet quality donkeys a year, as well as top breeding animals, and do rescue work with donkeys. We always have donkeys for sale in a diverse price range. We are proud of our donkeys and share them readily with anyone who is interested in learning about these wonderful, special animals. Please give us a call, or better yet, treat yourself to a visit! The donkeys and I would love to meet you!